Memorial monuments and war monuments in particular have become increasingly ubiquitous over the last two centuries. An emphasis has been placed on making sure that every event is remembered, and remembered in the correct way. In this time, the study of memorialisation and monuments has also flourished and on the eve of the 100 year anniversary of the First World War this discussion is still alive and well. With Michael Gove continuing to squabble with ministers and academics over the ‘right’ and ‘wrong’ ways in which the war is remembered (Boffey, 2014), plans being announced to restore war memorials across the country, and a national competition for designing new ‘paving slab’ monuments honouring recipients of the Victoria Cross (BBC News, 2013), it is clear that it has never been more relevant to talk about the importance of monuments in shaping how we both remember major events and forget them. Most people would agree that there is an intrinsic link between certain material objects and memories, and that the life of the material object equates to the life of the memory. Those scabby 2011 festival wristbands that you still wear? Or the teddy bear that you got from your ex which you threw away the moment the relationship ended? These acts reflect the traditional Aristotelian view in which memories are stored in material objects and when those material objects wither and decay, the memory is likewise forgotten (Forty, 1999). But memory is not simple. Memory is not a tangible, physical object you can hold in your hands. Memories can be repressed, memories can change over time. They are social constructs and therefore can never be seen as analogous to material objects. Some have even argued that when a memory becomes fixed to a particular object it actually enables forgetting (De Certeau 1998), in the same way that once you have written someone’s address down you don’t have to remember it anymore. Monuments can shape our memory or view of historical events through the practice of exclusion (Forty, 1999). 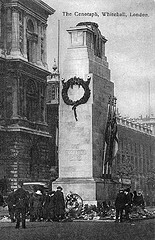 The Cenotaph in Whitehall, a monument to those who died from the British Empire in the two World Wars, is an example of how a monument can exclude all but one dominant idea of how the war should be remembered. The large white structure has the words ‘The Glorious Dead’ engraved into it, emphasising the grandeur of war whilst excluding the visceral horror of the deaths themselves. The use of flags in both the Cenotaph and The World War One monument in Cernobbio symbolises the purpose the deaths achieved. Monuments can be seen to play an important role in resolving issues of negativity and impotence through acknowledging that the loss of life was a worthwhile sacrifice for some great gain. In return for this sacrifice the living must express their gratitude through the building and visiting of memorials (Rowlands, 1999). These official structures of memory built from durable materials, accept the importance of memory and collect it into one particular location ‘to make the past past’ (Nelson and Olin, 2003: 3). However, there has been a recent move towards monuments, or anti-monuments, that recognise the capability memorials have to enable forgetting and aim to combat it, for example the Harburg Monument against Fascism. This steel column was coated with lead, into which people could inscribe their thoughts, feelings or simply their sign their names. Each time the monument became completely covered with writing it was lowered further into the ground. It is now underground, and can only be seen through a small glass window. Unlike traditional monuments, the column required interaction and engagement from those who saw it, and placed the responsibility for remembering in the hands of the people, not in the object. As it reads on the plaque by the piece ‘in the end it is only we ourselves who can stand up against injustice’ (Gerz, 1986). Other monuments which capture the above sentiment include the Stolpersteine or ‘Stumbling Block’ monuments which litter the streets of Europe and commemorate victims of the Holocaust. These blocks are placed in such a way that you literally trip up on them, unexpectedly bringing up memories. These blocks bring the past into the present, stopping you in your everyday activities. The Vietnam Veteran’s Monument in Washington, DC also promotes a relationship between the past and the present as it reflects the image of the viewer reading the names of the dead. It encourages the visitor to engage with their own practice of remembering and to question the role they play in the memorialisation process. World War One was the first war to spark the construction of monuments on an enormous scale and instigated the social movement of monument building. We can learn a lot about the process of memory construction from monuments currently being created to commemorate a war which began 100 years ago and of which almost no one is left who has a living memory of the conflict. Boffey, D. (2014). Gove and junior minister split over how to teach history of first world war. Guardian Online. De Certeau, M., L. Giard and P. Mayol (1998). The Practice of Everyday Life: Living and Cooking. Minneapolis: University of Minnesota Press. Forty, A. (1999). Introduction. In A. Forty and S. Kuchler eds. The Art of Forgetting. Oxford, Berg. Gerz, J. (1986). Monument against Fascism. Harburg. Nelson, R. and M. Olin (2003). Introduction. In R. Nelson and M. Olin eds. Monuments and Memory, Made and Unmade. Chicago, The University of Chicago Press. News, B. (2013). World War I centenary: Paving stones to honour heroes. Rowlands, M. (1999). Remembering to Forget: Sublimation as Sacrifice in War Memorials. In A. Forty and S. Kuchler eds. The Art of Forgetting. Oxford, Berg. Sherman, D. (1999). The construction of Memory in Interwar France. Chicago: University of Chicago Press.